Everything Birds offers a wide selection of bird cages that work great for Finches and other small birds, at great prices. It can be challenging to find quality bird cages for Finches. Too often retailers assume Finch owners only want small table top cages. The type you buy from a department store. Finch get their exercise from flying around so larger cages provide the best environment overall. Since most stand-up cages are made for parrots and not small birds like Finches, it can be challenging to find stand-up bird cages that work well for Finches and other small birds. Whatever your preference, Everything Birds provides a wide range of bird cages for all types and sizes of birds, including very small birds like Finches. - Maximum bar spacing of 1/2" inch! 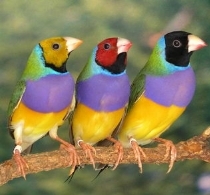 - Finches get exercise by flying. - Consider perches with different widths and tectures to keep feet healthy. 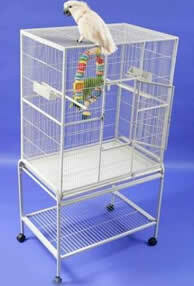 Shop Large Cages or Medium Cages or Small Cages for a Finch Cage. FEATURE CAGE: The Forte Flight cage is our most popular cage for Finches - it is an amazing cage for the price. Your finches will have plenty of room, it is easy to clean and easy on your budget. It is on sale today with free shipping! Available in several attractive colors.